Kaiser conducted a full-day workshop in Rivera for teacher candidates from Rivera and Tacuarembó on May 21. DJ Kaiser, associate professor and coordinator of Teaching English as a Second Language, has been traveling throughout Uruguay on a Fulbright U.S. Scholars Grant. Last year, he conducted preliminary research on a Faculty Research Grant on the project Ceibal en Inglés, which provides English classes to thousands of public school classrooms throughout Uruguay via videoconference. This year, Kaiser’s research focuses on the experiences of Uruguayan teachers in the project through a case study. He has already observed more than 70 class sessions in primary and secondary schools, has interviewed 15 different teachers, and collected survey data from more than 680 teachers. Kaiser has two more weeks of observations in a new city before returning to Montevideo to deliver final presentations to major stakeholders and decision makers in English language instruction in the country. In addition to his case study research, he has given a few workshops. 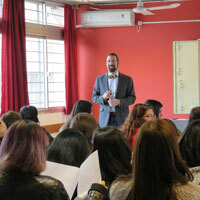 In March, his full-day workshop on Teaching English Pronunciation at the Instituto de Profesores Artigas in Montevideo (the teachers’ college) was attended by more than 70 people, many of whom traveled from the furthest parts of the country to attend. Kaiser then repeated this workshop in the northern city of Rivera to more than 60 attendees, and led a smaller workshop and discussion in Tacuarembó. Kaiser also had the opportunity to visit the Centros Regional de Profesores (the regional teachers’ colleges) in Rivera and Salto to interact with professors and students. His next stop will be Durazno, where he will start off the week with interviews for local television, radio, and newspaper. He will have observations for his case study with three more teachers in the city of Durazno and then have the opportunity to visit two different schools in more rural areas of the department. Kaiser reports that he has been well-received by Uruguayan teachers all over the country that have participated in Fulbright teacher exchanges to the United States. He has also had the opportunity to interact with many other Americans in Uruguay on Fulbright grants in various parts of the country. By the end of this three-month grant, his classroom observations, workshops, and excursions with other Fulbrighters will have taken him to 11 of the country’s 17 departments. After completing his research in Uruguay, Kaiser will travel to Rio de Janeiro, Brazil, for three weeks on a Faculty Research Grant to conduct research on the project EnglishWorks, which uses videoconference to help provide English language instruction to adult learners in some of the city’s poorest neighborhoods. After Rio, he will travel to the Brazilizn capital city of Brasilia for the BRAZ-TESOL conference to present on his research in Uruguay and Brazil.